Celebrating Doris with a special DVD! What a fun birthday, and what an extraordinary weekend! Thank you to all who came to Carmel to help us celebrate our dear Doris’ 92nd birthday. 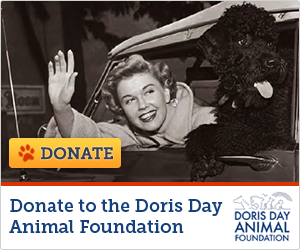 You made the weekend a huge success for the Doris Day Animal Foundation! An especially big thank you goes to Scott Dreier, who performed his critically acclaimed “Doris and Me” show to an enthusiastic audience the evening before Doris’ birthday, and who generously donated all of the night’s proceeds to DDAF. We also thank Jim Martinez and Laura Didier, whose concert of Doris’ music has become an annual tradition. And Doris’ wonderful co-stars -- Jackie Joseph, Bernie Kopell, Kym Karath and Brian Nash -- who so generously gave their time and talents to make the weekend extra special. They not only helped us raise funds for the animals (Jackie Joseph may have a second career as an auctioneer! ), but they also shared their loving stories of working with Doris, to our delight. Doris on her 92nd Birthday! Please contact Doris@ddaf.org they can help you concerning the price.